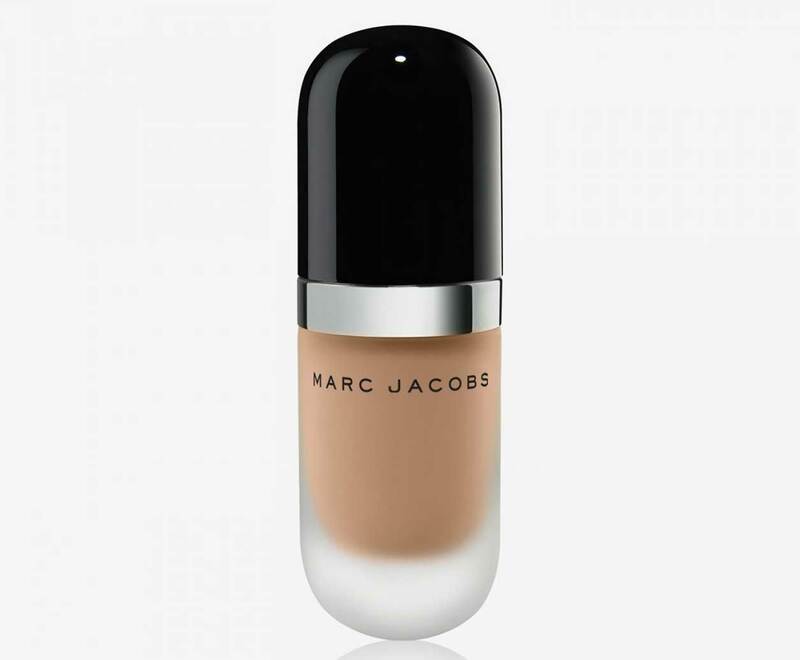 Today I’m looking at Marc Jacobs Re(Marc)able Full Cover Foundation Concentrate in Ivory 14. I am on a quest trying out new foundations. I don’t personally feel that there is one, perfect foundation for every single day and for every occasion, but I do like to check out new ones from time to time. I do not typically wear a full coverage foundation as a rule, but I do prefer full coverage for a more formal event. Also, full coverage foundations can tend to make a face break out, so I walk very carefully towards these. The other day I was wandering the aisles at Sephora, and I stumbled on the Marc Jacobs Re(Marc)able Foundation. It piqued my interest, but the price was a bit …daunting. It contains less product than the typical foundation (usually about one ounce), and Re(Marcable) weighs in at .75 ounces. It is also more expensive ($55) than I like to spend for a foundation. But, it’s Marc Jacobs, so I was curious about it. I mean … you know … Marc Jacobs. Since I wasn’t sure if I wanted to spring for the $55 price tag, I asked the beauty consultant for a sample to take home and try before committing. This is my big tip for the day! Notice the picture – this is the sample I received! If you don’t know this already, Sephora will give you a sample of the product to try before you commit. It is glorious! You should totally take full advantage of this option before filling your makeup drawers with products that you don’t like. Stay tuned to see if I am going to commit to this foundation or not. There are 20+ shades of this foundation! The glass bottle of Re(Marcable) Foundation looks somewhat like a pill. It is not a pump, and the applicator has a long tube with a round ball on the end to apply foundation to your face or brush. This is a very heavily pigmented, creamy type of foundation that dries to a full coverage, satin finish. It’s neither matte nor glowy. I did not detect a scent at all. It is surprisingly lightweight on your skin. It does dry rather quickly on your face, so you need to work kind of fast when buffing it onto your skin with a brush. You should use a dense brush (I used a Kabuki brush) to apply for best application, not a beauty blender or your fingertips. Use tiny amounts—three pea-sized drops. It will magically buff all over your face. I suggest starting with one on your nose and one on either check. Or, put a drop on the back of your hand and pick it up with your makeup brush to buff it into your face. If you don’t know this already, Sephora will give you a sample of the product to try before you commit. It is glorious! It is a buildable foundation. The first time I used it I applied too much. Not a good idea. Start in small amounts and build lightly until you are satisfied with the coverage. The coverage gives you a clean slate with little to nothing peeking through. If you have spots on your face that you are endlessly trying to cover, you might love this foundation. This is not a foundation to wear when you are going for the “natural” look. It’s a strong, full coverage foundation that feels so light on your face. You definitely look like you are wearing foundation, but when applied properly it is beautiful. It is long-wearing and stays in place. I did wear it one day when it was especially humid and the wear was not awesome by the end of the day, but, in all fairness this was one of those days when no foundation could hold up well. The struggle is real for my fellow Southern ladies. Frankly, it took me a few different times of wearing it to get the proper amount and application down well. There were a couple cons. As the territory goes with many long-wearing foundations that lean toward a matte finish, Marc Jacobs Re(Marcable) Foundation will exaggerate fine lines and any other crevices in your face. It is not for dry skin at all. This particular foundation works best on oily skin or combination skin that leans toward oily skin. Actually, this foundation can even look better with oily skin a couple of hours after application when your own oils rise to the skin’s surface. That isn’t a con though, is it? You can use a blotting powder for shiny areas later in the day if needed, and it will freshen and look good as new. I am not sure a person with more mature skin will love this because it might draw attention to lines. This would be a good time to get a sample before committing to the higher cost. My verdict is a mixed one with a clear outcome. I give it a strong 4.5 out of 5 for occasions when I want a flawless, full coverage foundation. For me, that would be when I am dressed nicer than my normal hang out day attire. I’d also go for false eyelashes when I wear this. I tested this product with no face primer for review purposes, and I think a primer would alleviate concerns of pores showing up strong. Now, for day to day wear, I would not wear this. It’s just too much coverage and too made up looking for my personal taste. I like a more sheer, glowy look for a normal day foundation. So, for those instances I give Marc Jacobs Re(Marc)able Full Cover Foundation Concentrate a 3 out of 5. Am I going to purchase it? A unanimous and resounding,“Yes!” It does cost a little more than others, but because application takes so little, it will last a long time. Just a heads up: I did read and hear that sometimes the lid opening can get kind of gunky. So if that kind of thing bothers you—stay on top of it and you should be fine.